Social inequality has been a part of life for as long as humans have existed, with individuals from both sides of the coin striving to reduce it. Matt Barnes, the Chair at IFF’s seminar last week on ‘Dividing Lines – the Role of Evidence in Reducing Social Inequality’ set a context for an interesting evening of discussions by taking us through a brief history in time of social inequality, starting 6,000 years ago when old agricultural land owners controlled access to weapons, taking in the Victorian era and Dickensian exposés of the gap between rich and poor and landing in the recent past when the Thatcher years saw the most marked and rapid increases in inequality in post-war Britain. Indeed, the battle between the ‘haves and have nots’ has been a primary driver in British voting patterns throughout modern history with lower earners typically voting left and higher earners voting right. 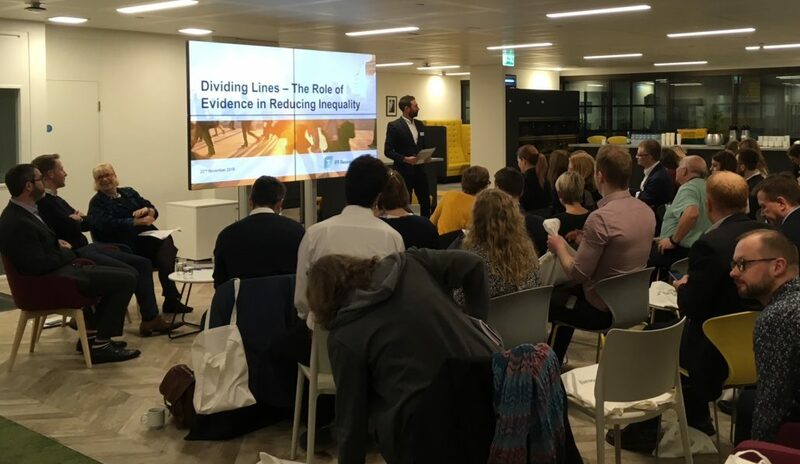 IFF’s latest seminar provided a new, evidence heavy take on what this gap means in today’s world and revealed that the research sector might benefit from widening its focus on this historic economic divide. Most in the research and policy worlds will be familiar with the evidence of the economic story, showing that the gap between the highest and lowest earners has shot up in the last thirty years and that the UK ranks among the most unequal societies in the developed world (ranking 6th by the Gini coefficient in 2015). Most will be aware of the plethora of data behind Danny Dorling’s powerful critiques of UK policy and the recent attacks on the richest 1%. 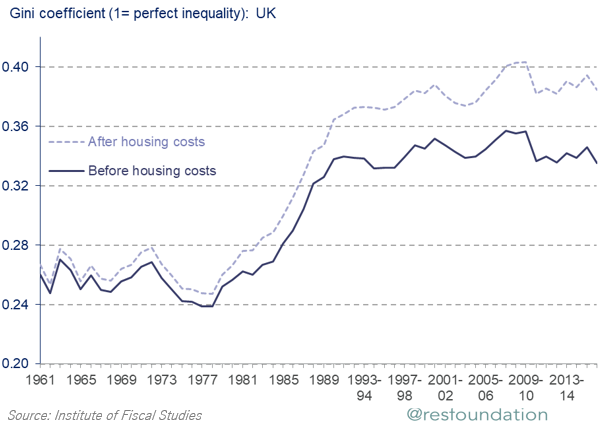 Speaker, Matt Whittaker of the Resolution Foundation highlighted an additional layer to this analysis, demonstrating that although the extent of inequality has on the face of it remained broadly consistent over the last twenty years, if we look at income after housing costs then it has in fact continued to rise. This is compounded by a slowdown in economic growth since the 2008 financial crisis which has seen average annual income decrease in real-terms for the poorest households and lowered the general mood of the country. Slide shared by Matthew Whittaker of the Resolution Foundadtion during his event presentation. Building on the economic story, IFF’s own Alistair Kuechel showed us how the financial services market and the government-led UK Financial Capability Strategy have attempted to address the impact of economic inequality on the financially squeezed portion of the public, offering support to improve the individual’s ability and confidence to manage their money more effectively through free online banking products like Pockit, and by using regulation to reduce the ‘poverty premium’ (the idea that poorer people pay more for essential goods and services, for example from higher fuel tariffs and up-front payment methods). 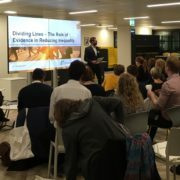 While these new initiatives were warmly received, Thursday’s audience reverted back to the core problem of the income gap and why the public and policy makers are failing to take notice of it. Awareness of the poverty premium among the public at large is low, and graphs of the Gini coefficient rarely make the front pages. Indeed, it was the lack of traction gained by the extensive evidence on the issue, diligently produced by the research sector, that emerged as the over-arching theme of Thursday night’s seminar. While Guardian columnist and broadcaster (and the most emotive speaker at IFF’s seminar) Polly Toynbee accepted that most politicians are conscious of the issue (look at Theresa May’s ‘burning social injustices’ speech on the steps of Downing Street) they are failing to use the wealth of evidence available to shape new policies. So why aren’t people listening? Perhaps this is a symptom of Trump’s post-truth world. Perhaps Gove was right and people really have ‘had enough of experts’. The feeling from Polly Toynbee was that the research world is failing to tell the economic story in a human way, to really engage people on an individual level. Matt Whittaker however took this one step further, revealing through his Brexit analysis that actually there are other stories at play, which researchers and policy-makers alike need to explore and employ before we can have a real impact. Brexit’s shock result has shone a light on new dividing lines that go beyond economic inequality and cut across income differences and left/right voting patterns. While income was a factor, it was intertwined with other divides between, to name a few, students and workers, home owners and renters, and those who perceive that their communities are getting along or drifting apart. Perhaps the most important factor straddling all these issues, was whether or not voters had a degree. Importantly, while we have a wealth of evidence on economic inequality, this is only one of a multitude of inequalities that the individual perceives as relevant to them today and questions remain unanswered about how these other factors affect individual choices. Matt went as far as to suggest that if the remain campaign had identified and engaged with these lesser-known divides, the referendum result could have swung the other way. When it comes to increasing the impact of research, we were left with the feeling that it is less an issue of poor story-telling, and more an issue of telling the wrong story. If we want evidence about social inequality to cut through the untruths, maybe we need to leave Danny Dorling’s graphs on the shelf and tell the stories that speak to what else really matters to voters now. As IFF perpetually endeavours to do, we need to improve our understanding of the new lines that are changing behaviour today.